Mithotronic - LEDmePlay Say Cheeze! "Say Cheeze!" 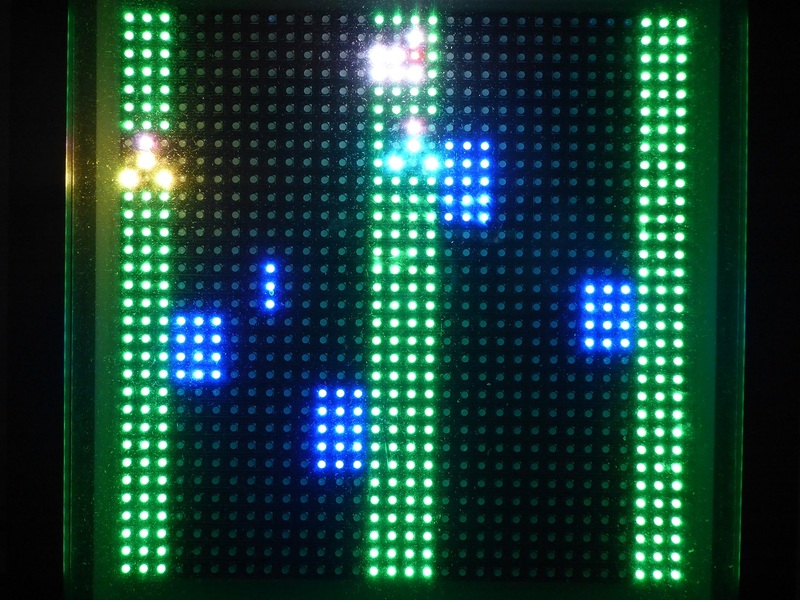 is a game for one player or two players and was inspired by the classic 1981 arcade game Frogger by Sega/Konami. During a traffic jam on the highway, bunny broke out of the taxi and escaped to the middle strip. Now comes the odd part (which is absolutely unheard of with real Leporidae): vain bunny promises to return to the taxi if and only if you photograph it five times. When looking left, it expects to be photographed from there, otherwise, from the right. While moving, or from too large a distance, bunny refuses to pose at all. While you were arguing with bunny, the traffic jam disintegrated. Now cars, motorcycles and trucks are flashing past. It goes without saying that you should avoid to be run over. If you make the acquaintance of a vehicle, you lose one of your six lives. After five snapshots, the game continues with faster vehicles, and bunny becomes more restless. In a two player game, both players play as tourists. They start on a strip at either side of the highway and together try to take the required number of snapshots. 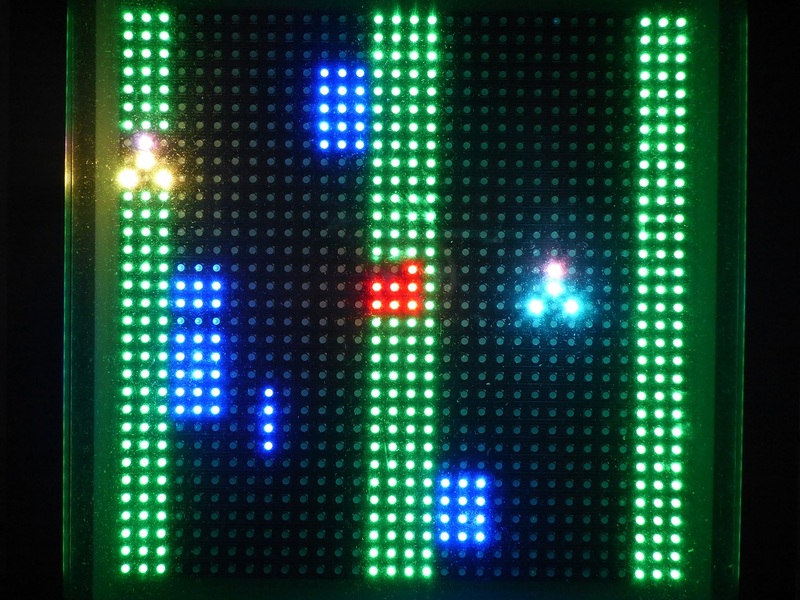 The players can either play against each other for a high score or in cooperation. Upon completing a level, both players are awarded one point. For a snapshot, a player is also awarded one point. If both players have lost six lives collectively, the game is over. The game was intended as a party game. Up to 99 players may engage in the game, each of whom identified by a number between 1 and 99. After the title screen, the game displays a menu in which the player(s) select(s) an unused number with the joystick(s). Occupied numbers are shown in red, unused numbers in green. The score gained with a particular number is kept in memory until the LEDMePlay is turned off. If a player wants to regain the score from an interrupted game, he/she may select his/her old number. The game will nevertheless start in level 0. If only one player plays the game, he/she must use joystick 2. Pressing the fire button on joystick 2 bypasses the number selection for the other player. When bunny is posing, it whistles. It looks in the direction that is indicated by its red eyes. For a snapshot, you need to be at the exact vertical position of bunny. If you are near enough, and it is looking at you, bunny turns red. You may hinder bunny from moving, but then you cannot take a snapshot. When you are in the upper part of the highway, you can shoo bunny downward the strip. When in the lower part, you can shoo bunny upward. This is useful in a collaborative game. After posing, bunny waits a random amount of time. Then, it randomly chooses a new position on the strip and starts moving towards it. A player may move freely on both sides of the highway. 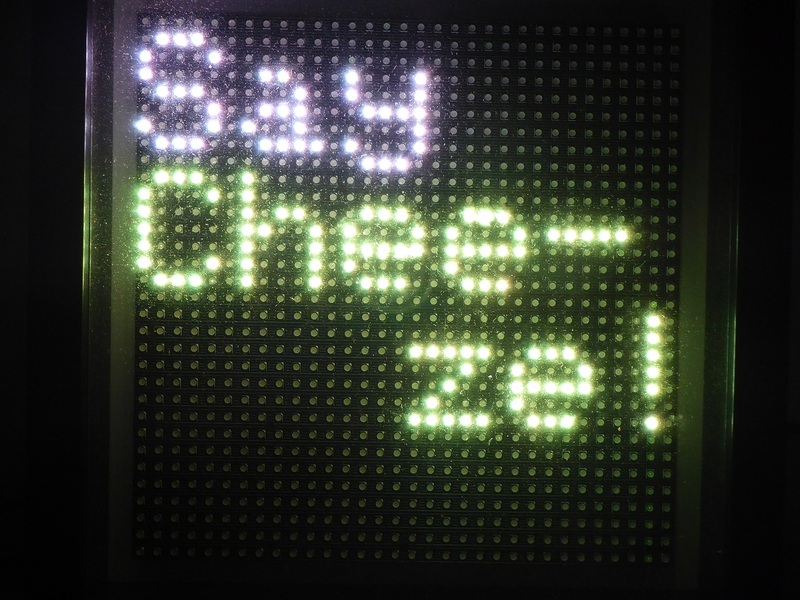 Watch the gameplay of "Say Cheeze!" on our YouTube channel. "Say Cheeze!" requires the Timer Library V1.3 which must be copied to the Arduino directory on your computer. The path is something as C:\Program Files (x86)\Arduino\libraries. What is 16 + 18?